Getting started – If your video is not already uploaded to YouTube, you will need to upload to YouTube, Vimeo and other video services, and then embed the code in your site. If you want to embed a YouTube video, simply go to the YouTube video you want to in your WordPress blog or post, and click on the Share button located under the video viewer. Copy the link and paste it into the WordPress Editor, where you create your blog posts. Update and save your post. You can now preview your post or go directly to view the new post. 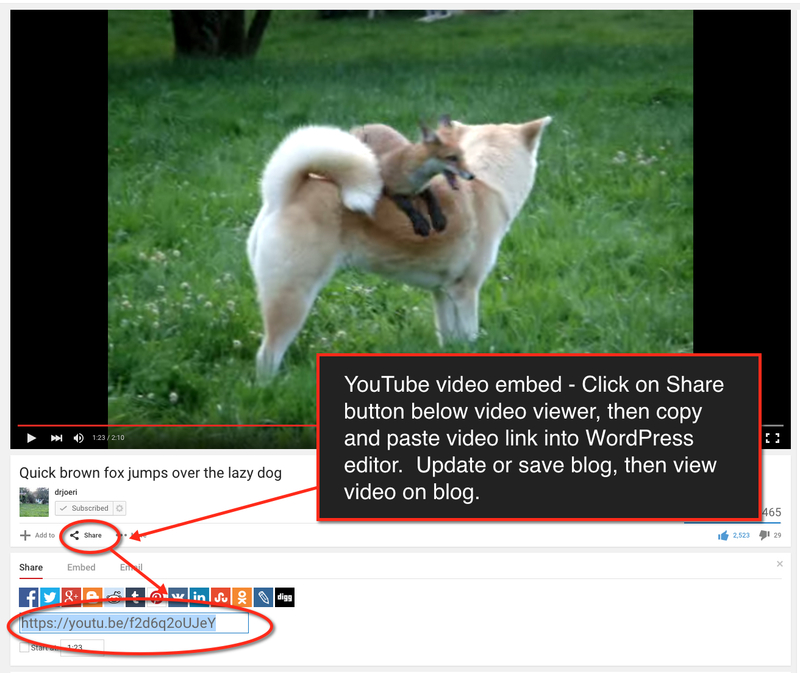 WordPress support has more details about embedding a YouTube video into your WordPress site. Make sure you can watch the embedded video in the WordPress post of page. An embedded video and a link to a video are not the same! This is a link to a video about a quick brown fox. This is an example of a video embedded into a WordPress post. Posted in St. Cloud State University, Technology, Video, WordPressTagged Embed video post page WordPress, Embed video YouTube, WordPress, YouTubeBookmark the permalink.